Aging can be fun. You’re never too old to learn something new, teach something you’ve mastered, or enjoy your favorite activities. Healthy aging includes hobbies that keep you moving, engage the brain, and boost your morale. A life of meaningful activities helps seniors decrease stress and anxiety, avoid loneliness, inspire creativity, and engage in life! Walking — One of the most convenient and inexpensive fitness activities available, walking helps seniors maintain their independence while increasing health and well-being. From mall walking, to hiking, to casual strolls in one’s neighborhood, walking is easy on the joints, and can be done with friends or family to increase your enjoyment. Swimming — A joint-friendly fitness choice, swimming offers great overall body conditioning for aging seniors. Golfing — Why not take up golfing to enjoy some fresh air while increasing your fitness level? The beauty of the golf course, the social enjoyment of getting out with friends or family, and the range of motion necessary to play golf combine to make it a great choice for aging seniors. Biking — Stationary bikes are fabulous for indoor workouts year-round for healthy aging. Biking outdoors increases balance and overall conditioning level. Fitness classes — Fitness classes designed for healthy seniors bring a social aspect into regular exercise that refreshes seniors by building healthy bodies and relationships simultaneously. Water aerobics — For low-impact, joint-friendly fitness classes, look to water aerobics for a healthy choice. Strength training — Fortify your healthy bones and muscles by strength training as a means of conditioning. Build strength while preventing muscle loss and falls. Promote mobility by lifting weights. Gardening — For a rewarding hobby, enjoy gardening’s health benefits, the delicious food that results, and refreshing time spent outdoors. Gardening helps seniors maintain mobility, increase endurance, and decrease stress levels. Artwork — Painting with watercolors or oil paints can be both relaxing and fun. Sculpting or scrapbooking are other creative, artistic hobbies that can offer a great platform to cultivate relationships with family and friends when done together. Crafts — Retirement is a great time to enjoy making crafts, and the result can become thoughtful gifts for your family. Embroidery, knitting, quilting, sewing, stained glass, leather crafts, and making pottery are just a few of the many fun options from which to choose. Crafts classes offer socialization as well as the satisfaction of a creative, fruitful result. Learn a musical instrument — Retirement offers the time to take music lessons and accomplish an enjoyable new skill. Host — Invite your family over more often. Babysit — Grandchildren benefit from regular time with grandparents, building relationships and strengthening family bonds. Write — Send text messages, cards, and letters to those you love. Technology — Use FaceTime, Skype, and other avenues technology offers to talk with your family face-to-face even across the miles. 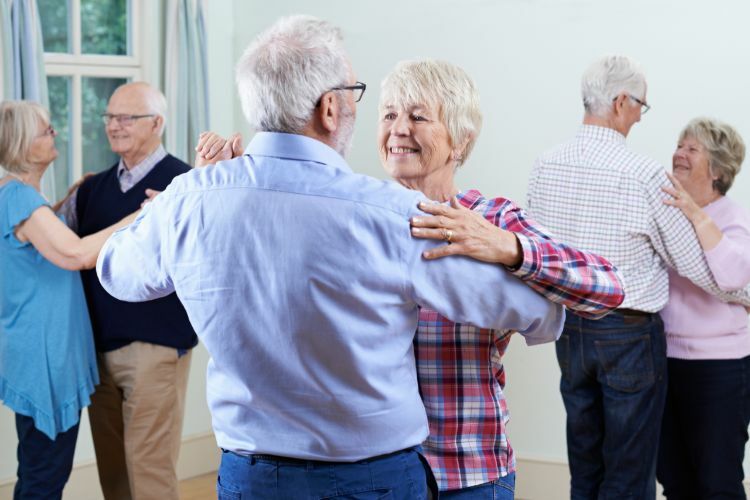 Ballroom dancing — For exercise and socialization, ballroom dancing offers fun for all those who participate. It helps seniors maintain balance, endurance, and coordination. It may even help reduce the risk of falling. The cognitive challenge of memorizing complex dance steps can help keep the brain fit too, a great bonus while you have a lot of fun. Pug: a small, affectionate dog that doesn’t require a lot of exercise. Cocker Spaniel: a happy, loyal, affectionate and charming dog. Chihuahua: a protective yet small dog with a great personality and plenty of affection. Boston Terrier: a friendly companion dog that is attentive to its owner’s needs and easy to groom. Shih Tzu: a playful dog who also enjoys sitting in its owner’s lap. Poodle: an easily trained, smart, adaptable dog with a non-shedding coat, and less pet dander than other dogs (hypoallergenic). Pomeranian: a lightweight, intelligent dog that is easy to handle. Teach — It’s rewarding to impart what you know to others. Consider teaching the field you are an expert into the next generation, or even your peers. Or, teach your hobbies like knitting or gardening. Contact your community center, church, or adult community education program to apply for a teaching position. Volunteer — Everyone loves to be needed, and communities need volunteers for everything from special events to weekly Sunday school classes. Volunteer and enjoy the satisfaction of sowing your time where you are needed. Puzzles — Crossword puzzles and traditional puzzles offer you great opportunities to stay healthy mentally. The relaxing social gathering around a puzzle offers a great option for a hobby that helps both mind and soul. Books — Reading books keeps the brain active. Cards — Keep your mind sharp by playing cards regularly. The mental stimulation cards provide enhance your thinking skills. Adult learning — Check out the local community college listings of classes. Higher education decreases the risk of cognitive decline. Learn something new, and enjoy the benefits of a healthy brain. The Parke offers senior living at its finest with activities you’ll enjoy. For a free meal and a tour of our community, contact The Parke today.